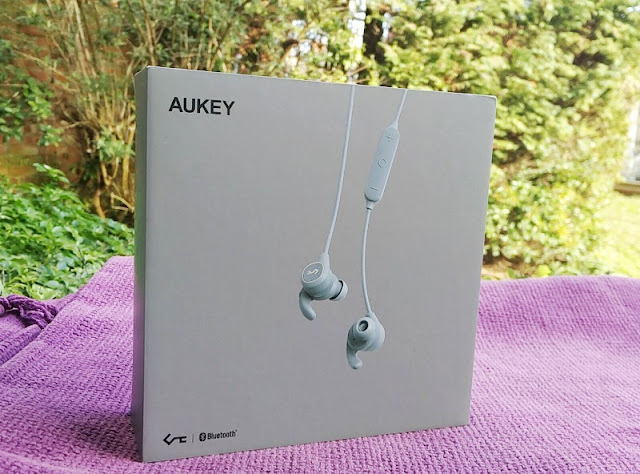 Part of AUKEY's Key Series line up, the EP-B80 and the EP-B60 earphones have a lot in common, namely bluetooth 5.0 chip, IPX6 rating and USB-C charging. Both look like the exact double of each other, although the EP-B60 earphones house a different driver setup which features 8mm dynamic drivers that support AAC sound quality (for Apple devices) and SBC sound quality (for Android devices). The EP-B60 have a livelier sound signature with more emphasis on the bass mainly because of the EP-B60's dynamic drivers. 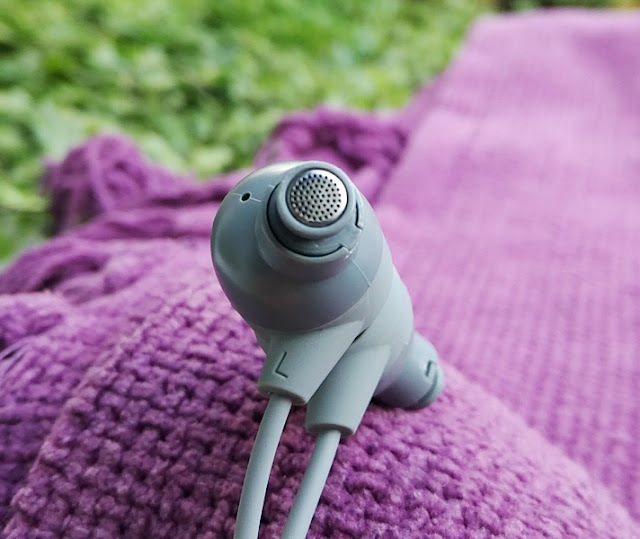 The EP-B80 earphones, in the other hand, have a more neutral, balanced sound signature with emphasis on the mids thanks to their hybrid balanced armature and dynamic driver combination. 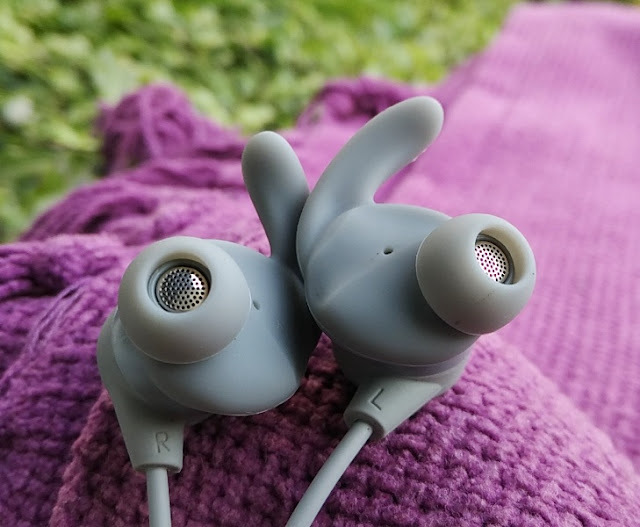 Both the EP-B60 and EP-B80 have IPX6 water resistance but the EP-B60 earphones are a sportier version, featuring ear wings and magnetic backing. 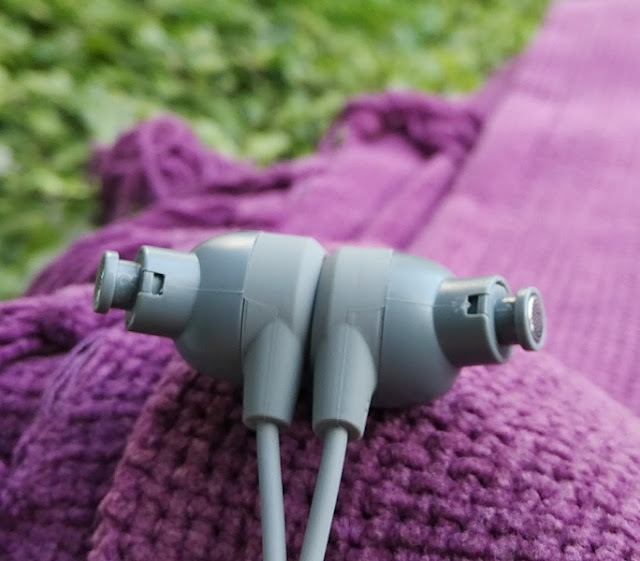 The backing of the EP-B60 earphones shell contains magnets that allow them to be joined together magnetically when in close contact. 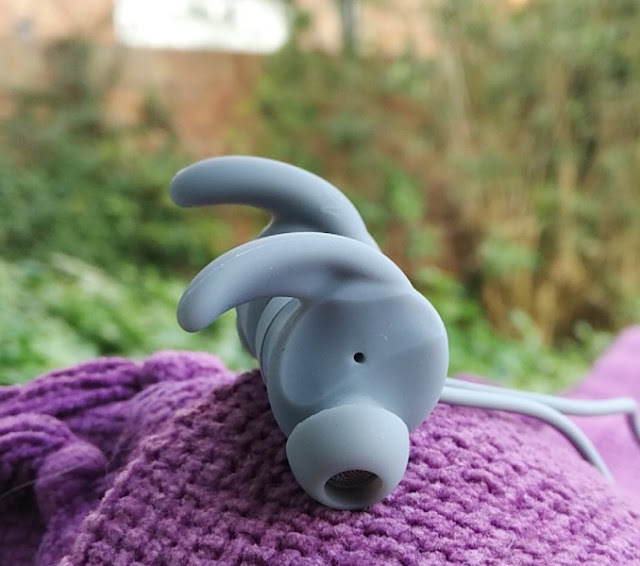 A magnetic backing feature on gym earphones is always nice to have as it allows you to keep the earphones securely around your neck. 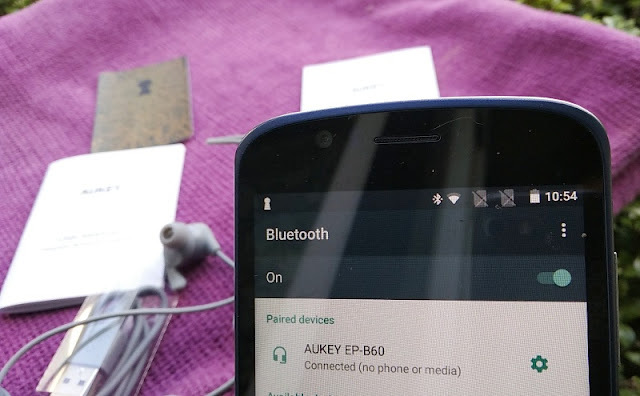 The magnetic backing feature on the AUKEY EP-B60 also doubles as a remote power control that automatically powers on the earbuds when you detach the magnets and automatically power off when you attach the magnets. 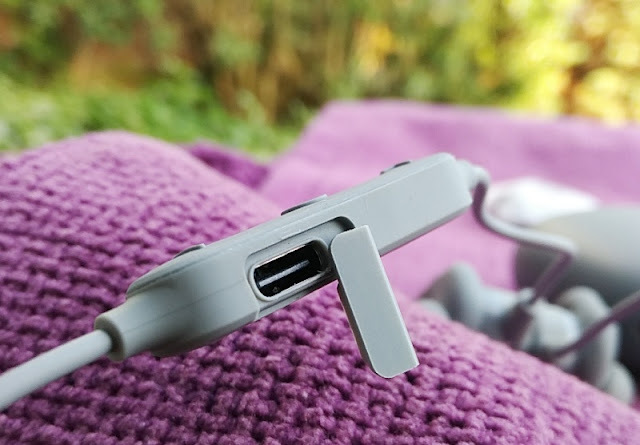 The magnetic-auto power on/off feature is pretty neat because after the initial pairing, the earphones connect automatically to the paired device when you detach the earphones without having to press any buttons which is super convenient. 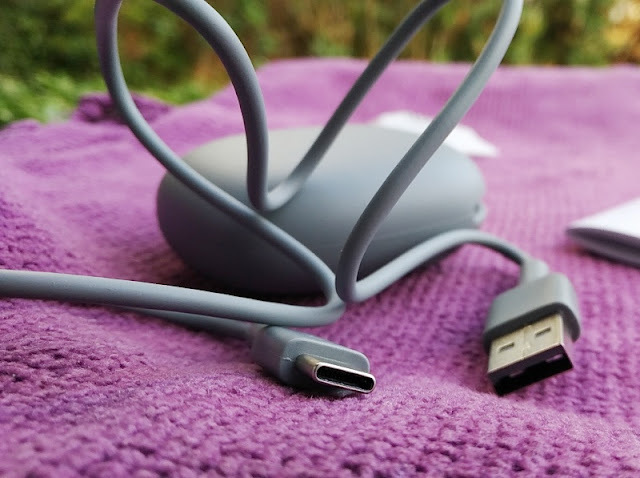 The earbuds can be paired to multiple devices but automatic connection is only for the last paired device. 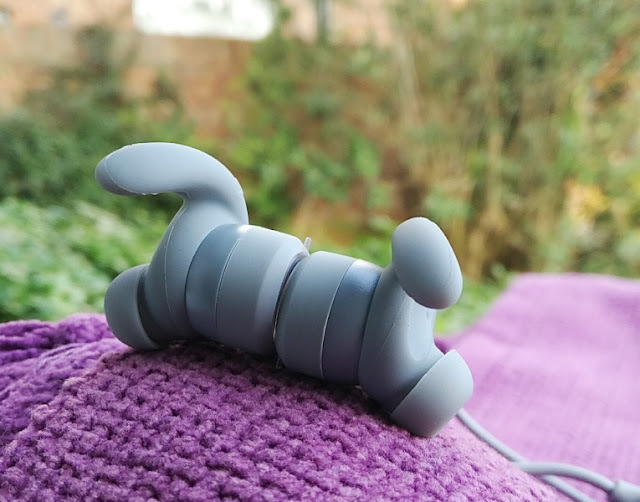 Both the earphone shells and 3-button remote control are made of grippy rubberized plastic which makes them easy to grip even with sweaty hands. Weight-wise, the EP-B60 weigh 250 grams, while the EP-B80 weigh 277 grams. Both offer comfortable fit although the over the ear style of the EP-B80 earphones make them more secure to wear. The EP-B60 ear wing design is very unique, fusing the wing and nozzle tip in one rubber piece that is surprisingly very easy to attach and remove. The user control buttons are operated via short and long presses and consist of three buttons designated by raised symbols for tactility. The Circle symbol is the play/pause/answer call button, the Minus symbol is the volume down/skip track backwards button and the Plus symbol is the volume up/skip track forward button. The buttons have a responsive and silent click and are activated by lightly pressing on them without excessive force. The built-in microphone doesn't integrate noise cancellation but has good volume gain with clear pickup pattern. The EP-B60 three-button remote is located inline a very long cable. 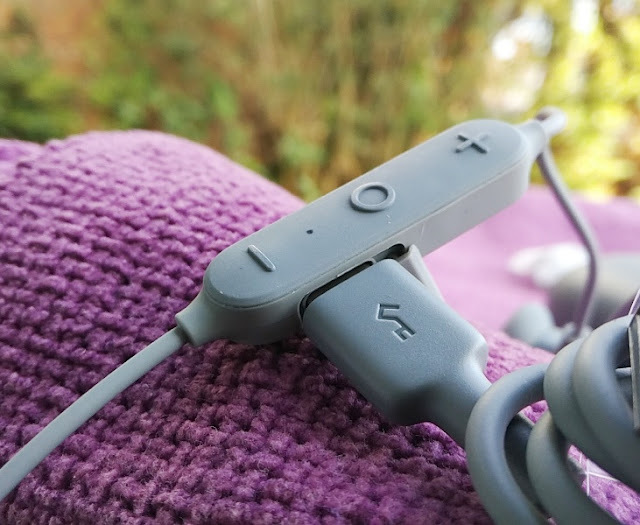 From earbud to earbud, the cable measures almost 50cm long so after adjusting it with the cinch slider there is a lot of cable slack so the cable hangs loosely on the back of your neck. 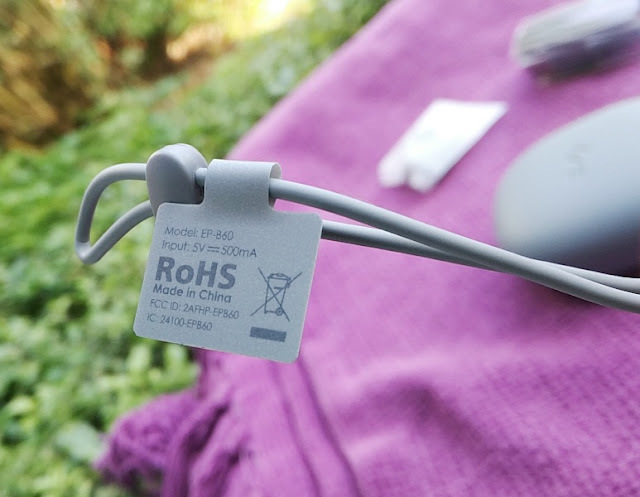 With that said, the cable is made of the same durable and grippy rubber material as the rest of the earphones, which is nice. 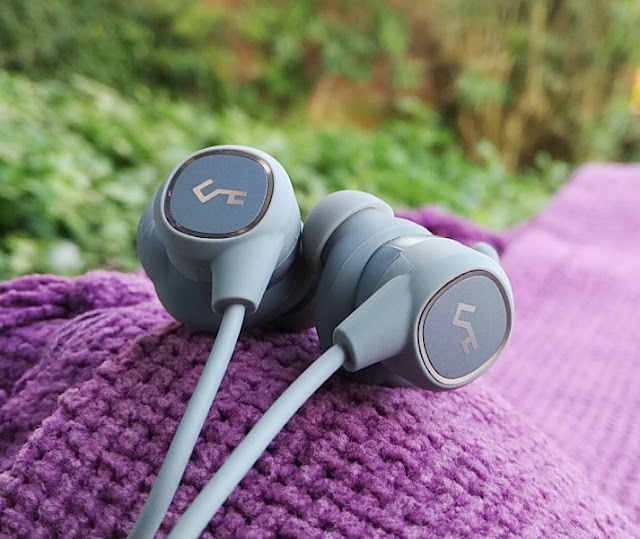 Connectivity-wise, the EP-B60 earphones work wirelessly via Bluetooth 5.0, which is the latest version of bluetooth offering better energy consumption as well as longer wireless range and faster data transfer. 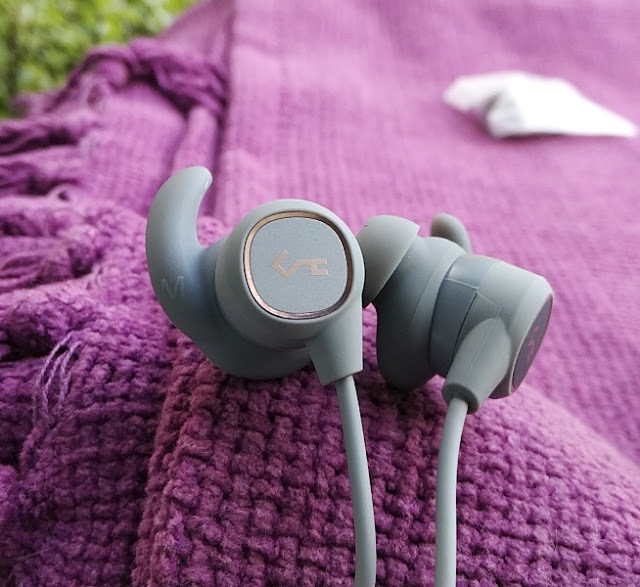 Saying this, most Bluetooth 5.0 earbuds still retain the same 10-meter wireless range as Bluetooth 4.2 earbuds and the AUKEY EP-B60 earphones are no different. 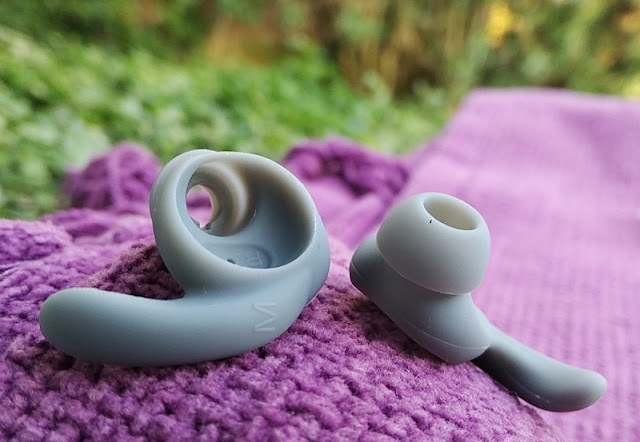 Bluetooth 5.0 earbuds are more than capable of having longer wireless range but one reason why manufacturers don't boost the range is because longer range equals more battery power; hence shorter battery life. 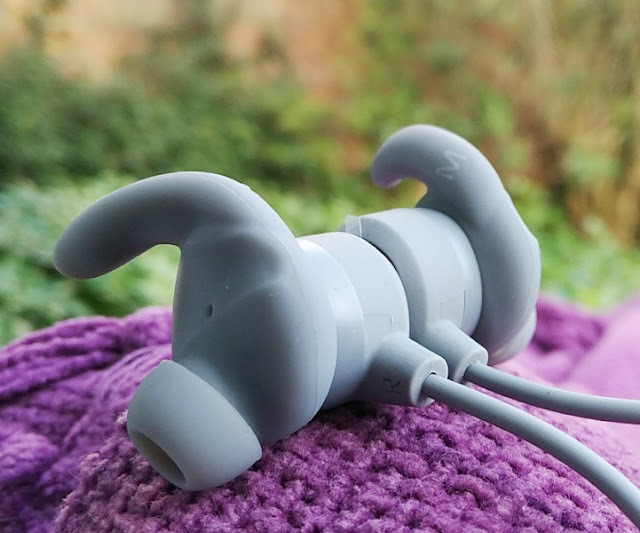 Speaking of battery life, each B60 earbud shell houses a 60mAh lithium polymer rechargeable battery capable of storing enough battery charge to power the EP-B60 earphones for a solid 7.5 hours. Full charge takes 90 minutes thanks to quick charge which delivers 80 minutes of battery life from a 10-minute charge. The AUKEY EP-B60 shell housing has an IPX6 water-resistance rating so they are not submersible in water but they can resist sweat and water splashes. 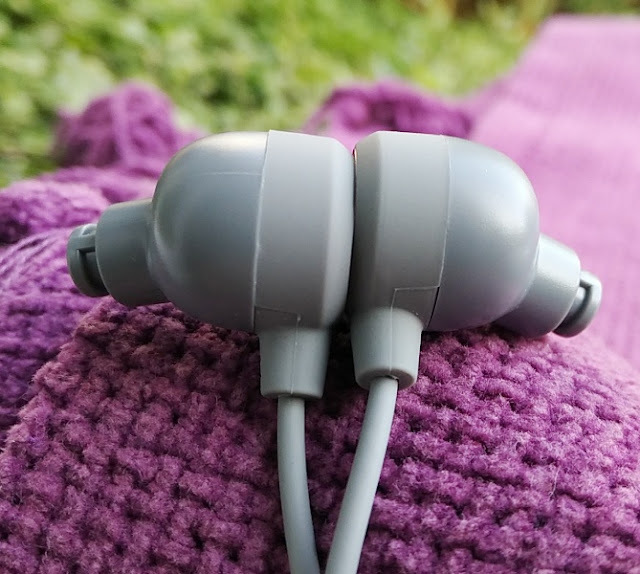 Having an "IPX6" rating as opposed to an IP67 rating means the AUKEY EP-B60 gym bluetooth 5.0 earbuds have not been tested against dust ingress. Ingress Protection (IP) ratings are somewhat confusing but basically, anytime you see an X (i.e. IPX6) it means the device in question has no dust rating. The first number after IP denotes dust protection with 6 being the highest dust rating, while the second number denotes water resistance with 8 being the highest water resistance rating. 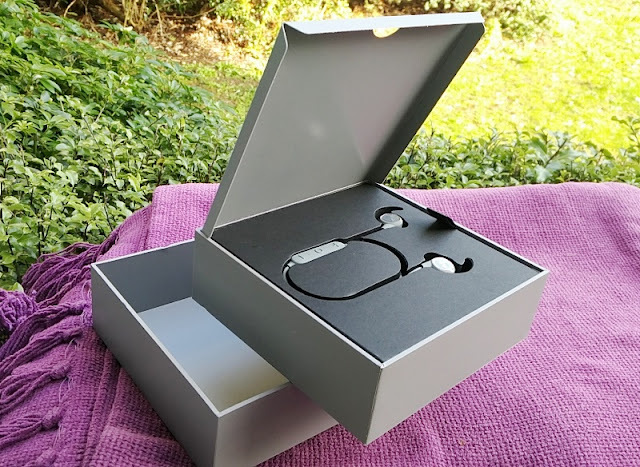 Not having a dust protection rating on earphones isn't really a problem since earphones are designed to be worn on the ears, unlike outdoor portable speakers which are designed to be on the ground; hence the importance of dust protection. 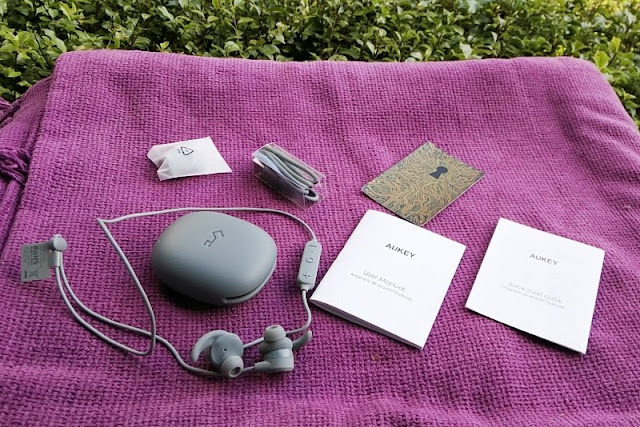 Along with the B60 earbuds, AUKEY includes a rubber pinch pouch to store the earbuds, a USB-C charging cable, spare ear wing tips, 24-month warranty, a quick start guide and user manual.